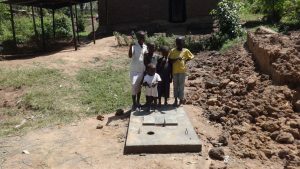 The people of Shitungu Village wake up very early in the morning prepare their children for school and work on their farms. 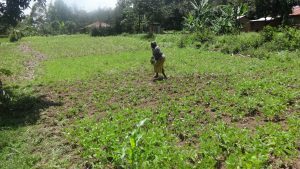 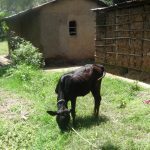 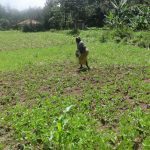 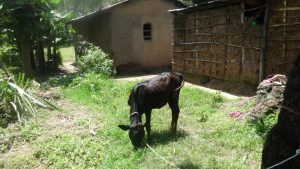 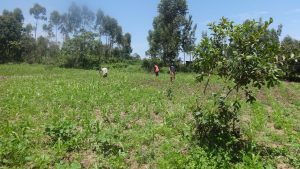 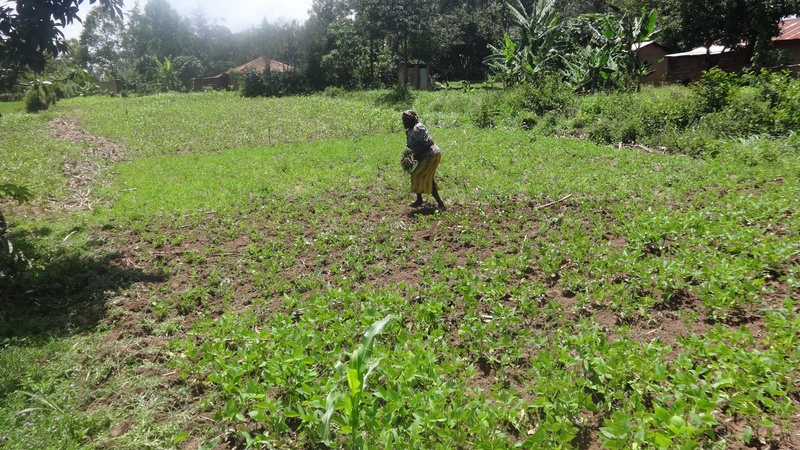 The community keeps dairy cattle and grows maize, groundnuts, bananas and other vegetables. 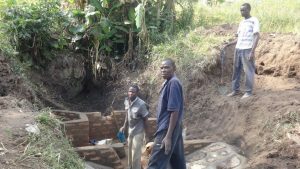 In addition to that, the men often harvest sand to sell to construction companies to earn a living. 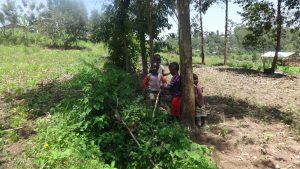 This community is special because the money they earn from dairy farming and crop production allows them to send their children to school. 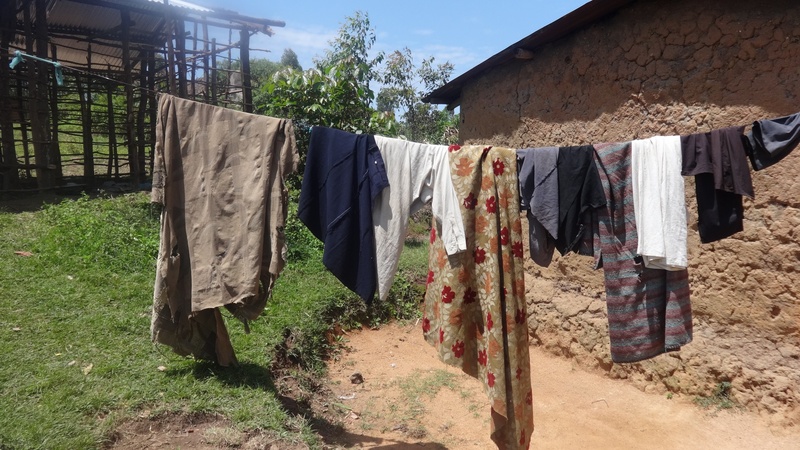 210 people from about 30 different households all report to rely on Omar Rashid Spring. 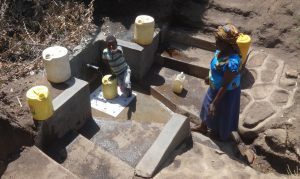 The water they fetch from here is used for drinking, cooking, cleaning, and watering their crops when it doesn’t rain. However, this water source is open to contamination that is causing its drinkers to fall ill. They suffer from diarrhea, headaches, and stomachaches that are often diagnosed as typhoid. And since this water slowly pools at the surface, the area has become a breeding ground for mosquitoes – making malaria a reality for those fetching water on a daily basis. At the time of our visit to Omar Rashid Spring, nobody was fetching water. 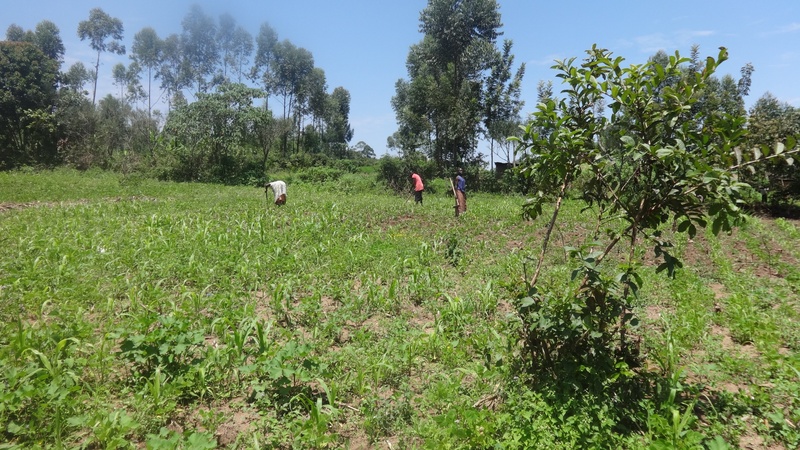 It was late morning, and everybody was already out working on their farms. 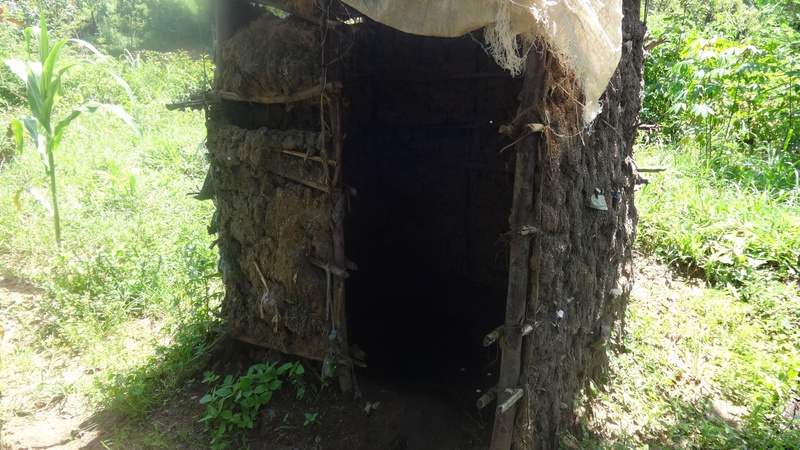 Quite a large number of households don’t even have a basic pit latrine. 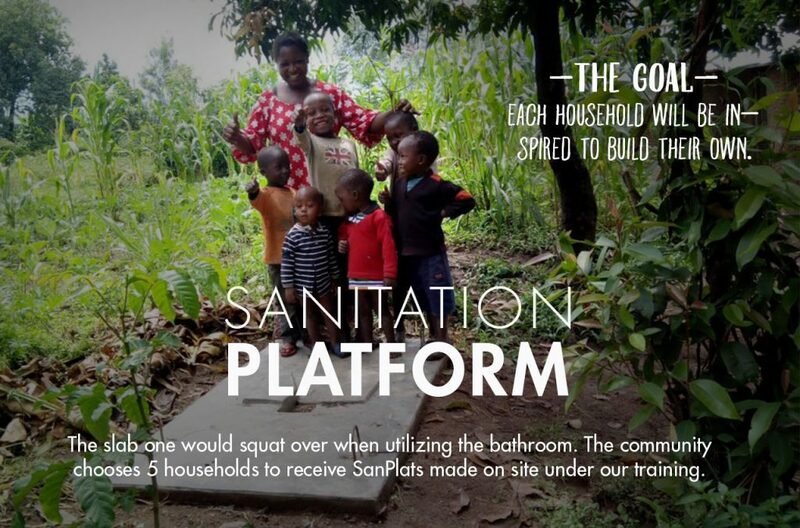 In fact, at least half of them either share a latrine or practice open defecation. Most of the latrines we got to visit were made of wooden slats, mud, and iron sheets. 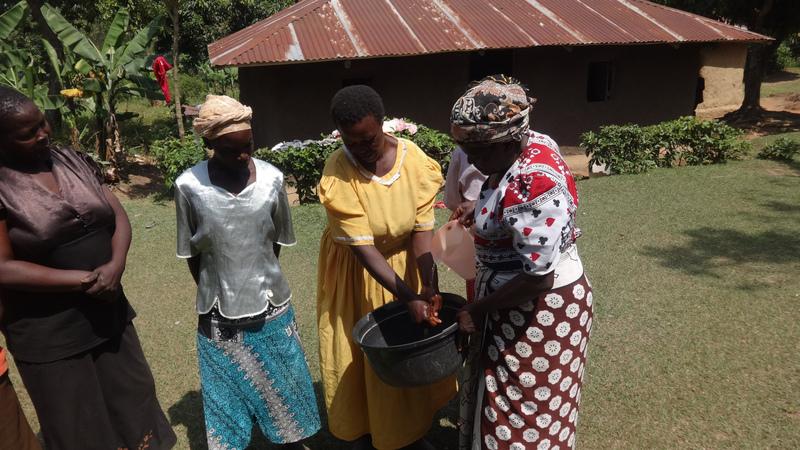 We need to focus on hand-washing during training, because there were no hand-washing stations to be found. We found lots of clothes drying on bushes and the ground. 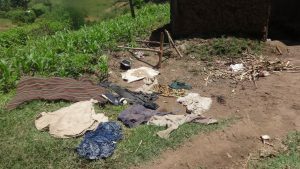 Extra tools are needed to keep clothes, dishes, and other belongings up off the ground. 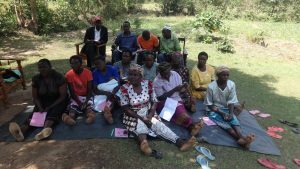 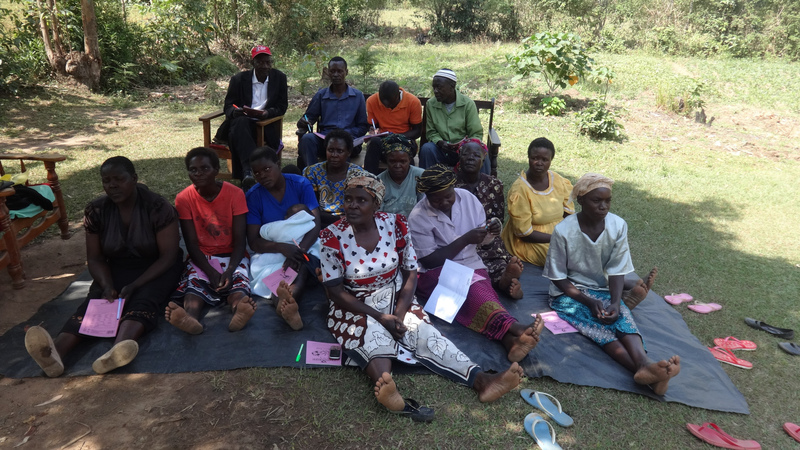 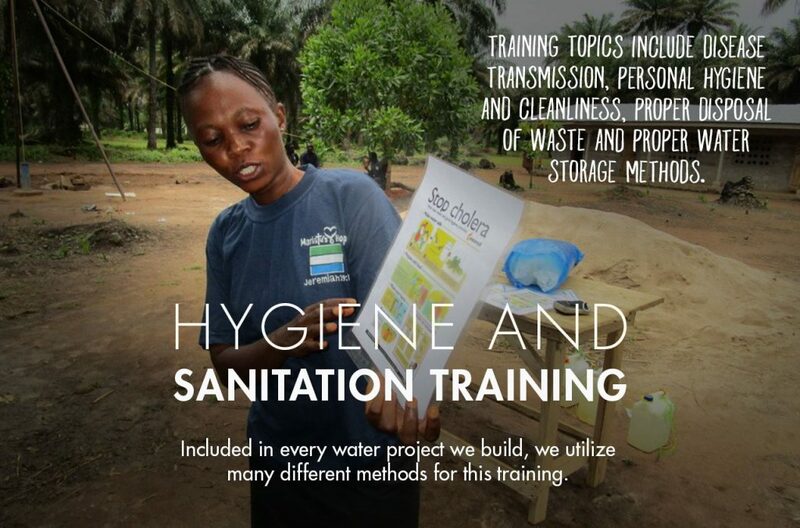 Community members will attend hygiene and sanitation training for at least two days. This training will ensure participants have the knowledge they need about healthy practices and their importance. 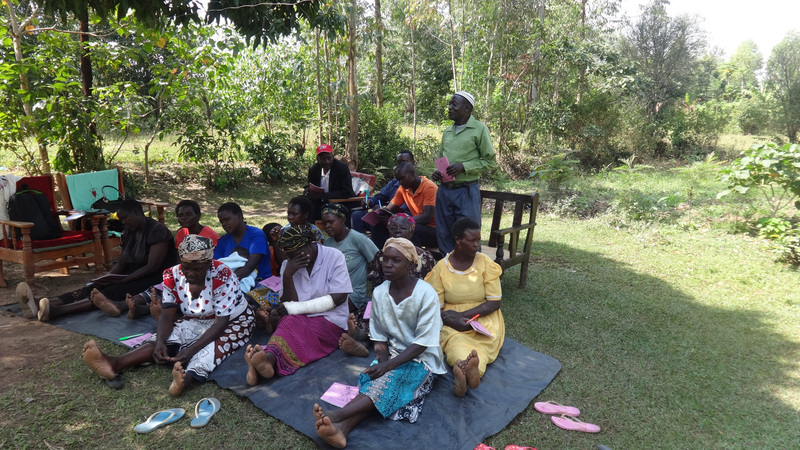 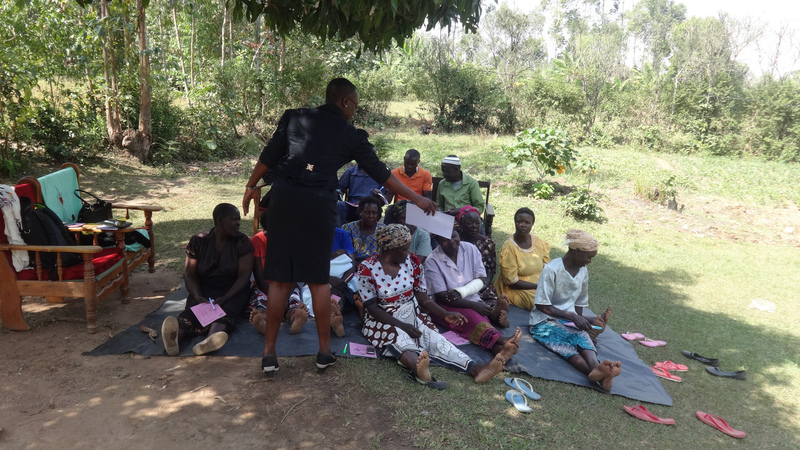 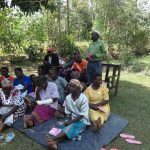 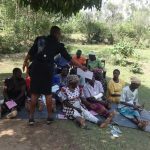 The facilitator plans to use PHAST (Participatory Hygiene and Sanitation Transformation), CLTS (Community-Led Total Sanitation), ABCD (Asset-Based Community Development), group discussions, handouts, and demonstrations at the spring. 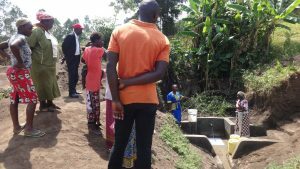 One of the most important topics we plan to cover is open defecation and its dangers, as well as having and using a pit latrine. Fetching water is predominantly a female role, done by both women and young girls. 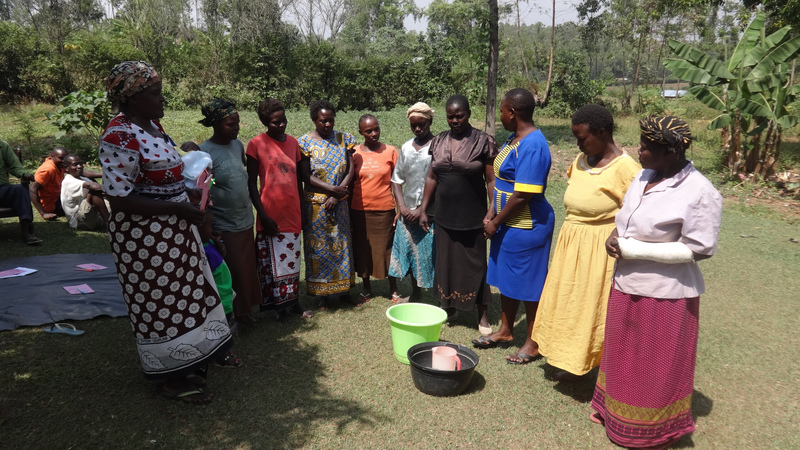 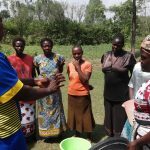 Protecting the spring and offering training and support will therefore help empower the female members of the community by giving them more time and efforts to engage and invest in income-generating activities. 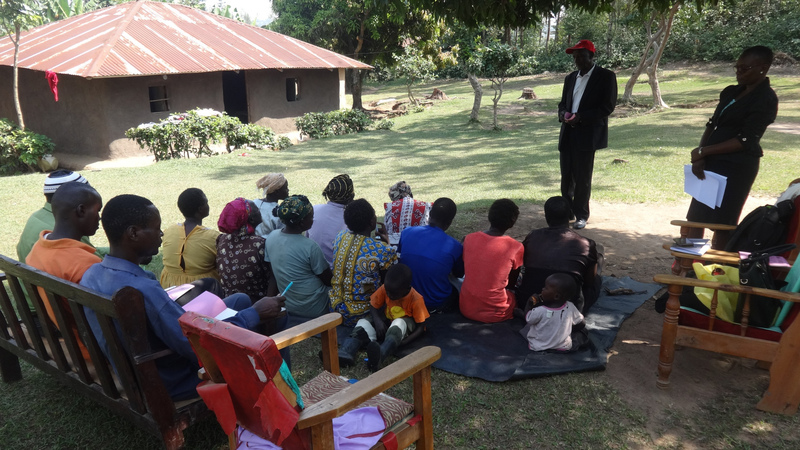 Furthermore, there’s a mixture of Christians and Muslims in Shitungu. 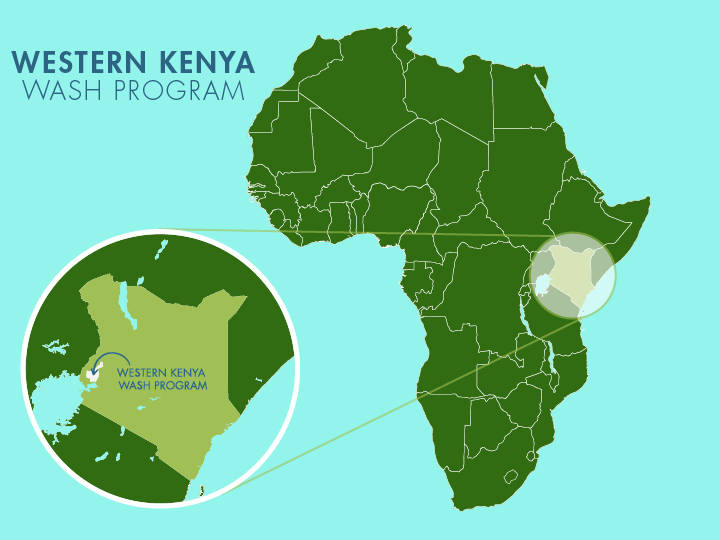 We’re excited to see how clean water will bring together both of these religious groups. 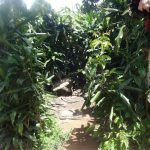 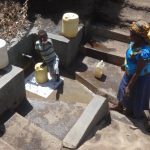 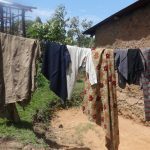 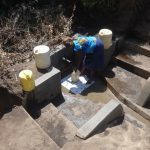 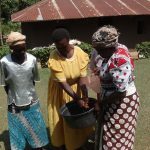 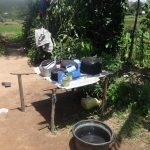 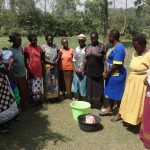 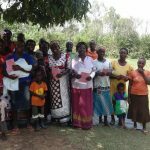 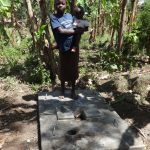 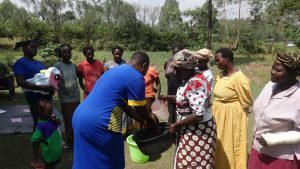 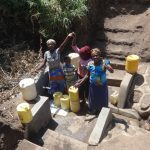 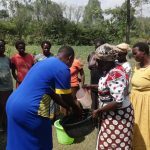 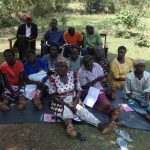 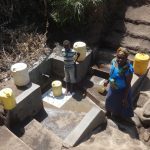 Shitungu Community now has clean water! 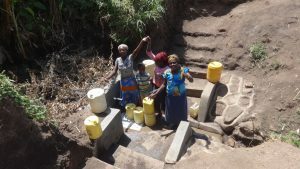 Omar Rashid Spring has been transformed into a flowing source of clean water thanks to your donation. 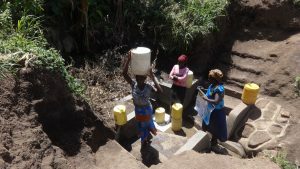 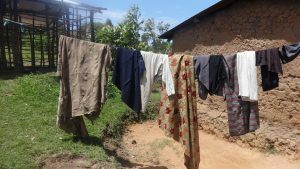 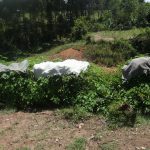 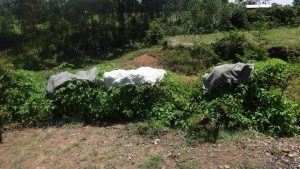 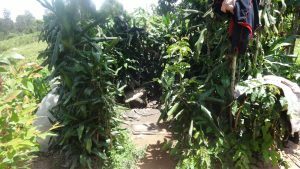 The spring is protected from contamination, five sanitation platforms have been provided for the community, and training has been given in sanitation and hygiene. 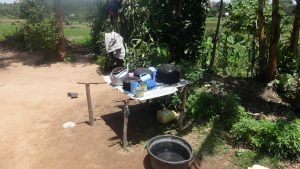 A hygiene and sanitation training was held at Mr. Omar Rashid’s home since he’s the one living closest to Omar Rashid Spring. 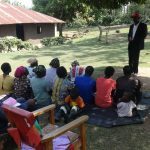 He also made the rounds in Shitungu to let everyone know about the big event and how important it is to learn things that will improve both community and individual health. 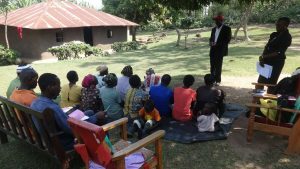 When we arrived, we were happy to see he managed to gather 20 participants who all sacrificed their valuable time to be there early for us. 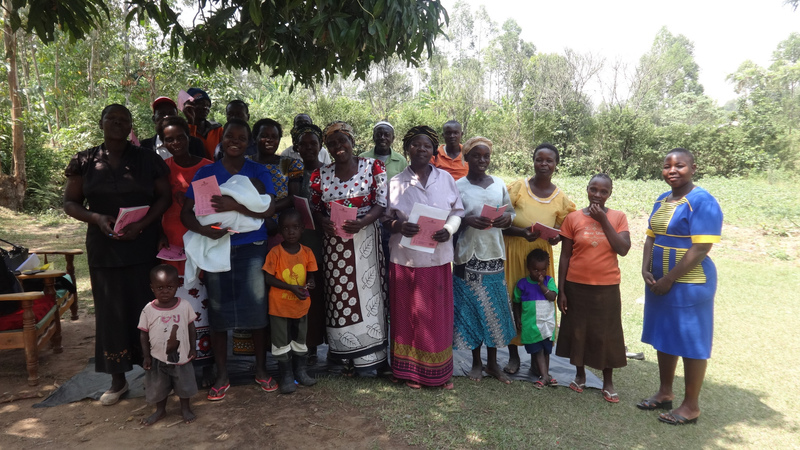 Training participants received new notebooks and pens to help remember what they learned. Construction at the spring had just finished, and so the entire group walked over there for a hands-on demonstration. 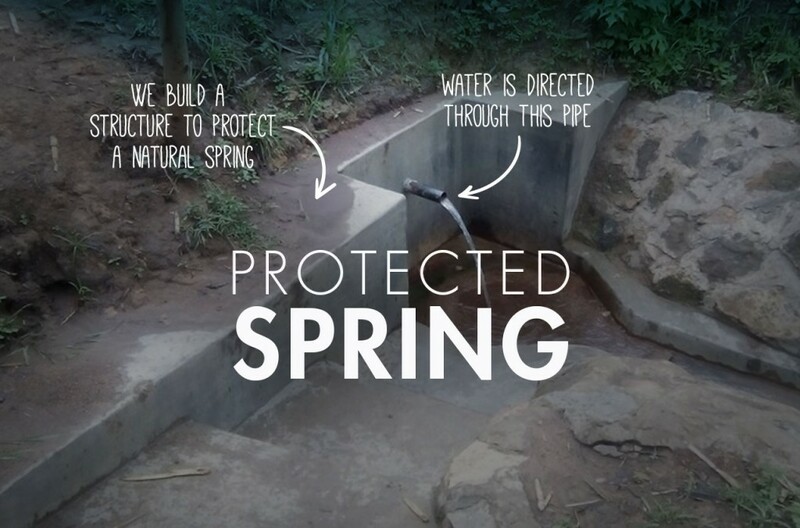 They learned how to properly use, manage, and maintain Omar Rashid Spring. 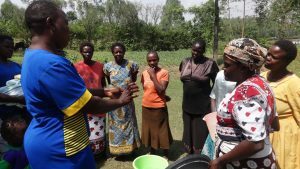 More importantly, they learned how to fetch, handle, and store clean water so as to ensure it’s still clean at the time of consumption. 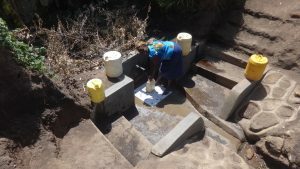 All five sanitation platforms have been installed. 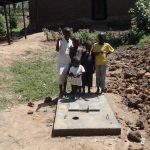 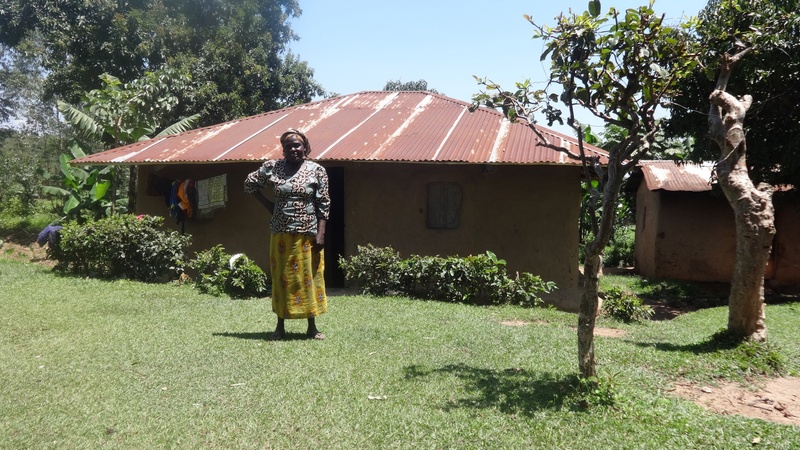 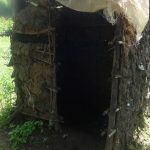 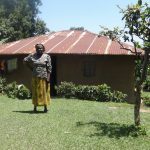 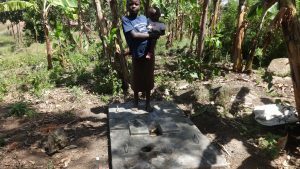 These five families are happy about this milestone of having a private latrine all their own, and are optimistic that people will no longer leave waste outdoors. 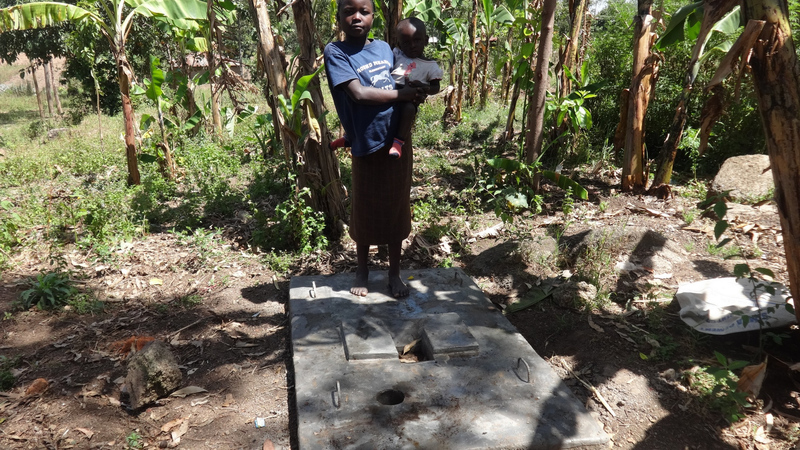 We are continuing to encourage families to finish building walls and roofs over their new latrine floors. 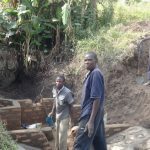 Community members provided all the required locally available construction materials, e.g bricks, wheelbarrows of clean sand, wheelbarrows of ballast, fencing poles and gravel. Accommodations and meals were provided for the artisan, and we asked a few people to volunteer their time and strength to help the artisan with manual labor. The spring area was excavated to create space for setting the foundation of polyethylene, wire mesh and concrete. 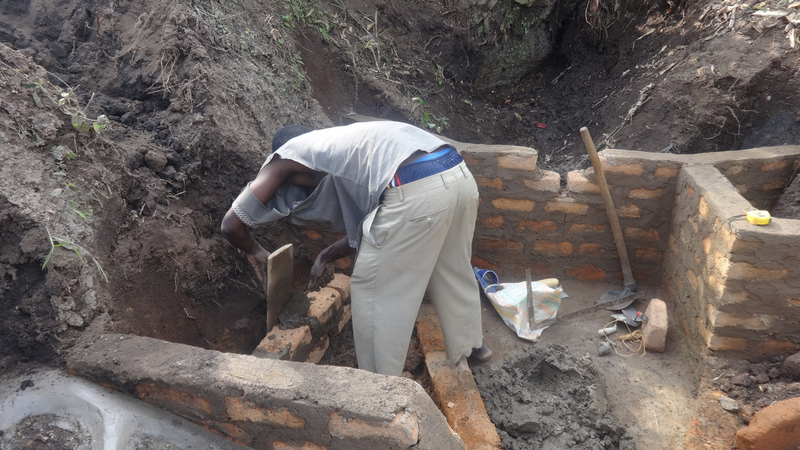 After the base was set, both wing walls and the headwall were set in place using brickwork. 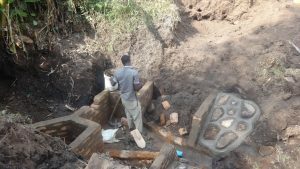 The discharge pipe was fixed low in place through the head wall to direct the water from the reservoir to the drawing area. As the wing walls and head wall cured, the stairs were set and the tiles were fixed directly below the discharge pipe. 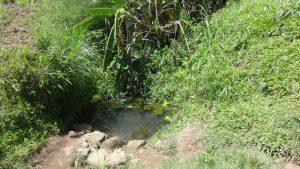 This reduces the erosive force of the falling water and beautifies the spring. 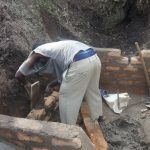 The process of plastering the head wall and wing walls on both sides reinforces the brickwork and prevents water from the reservoir from seeping through the walls and allows pressure to build in the collection box to push water up through the discharge pipe. 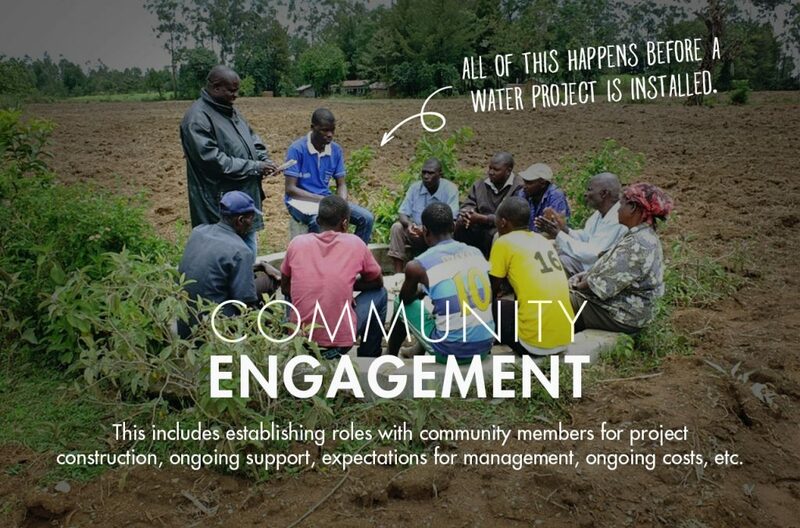 Since the concrete around the spring needed time to dry, we set a day to meet community members there and celebrate. 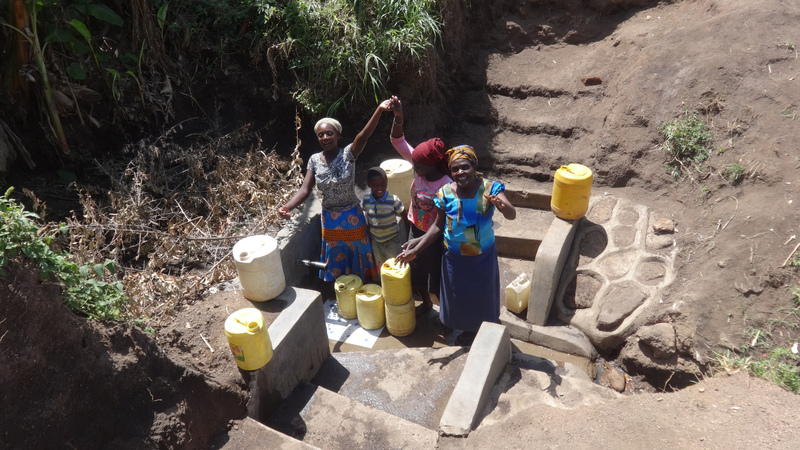 This wasn’t only a chance to celebrate the concrete drying, but clean water, too! People brought their containers to fetch clean water for the first time. 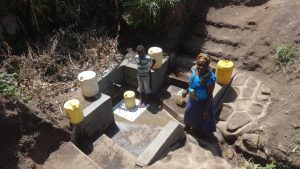 “This will help reduce waterborne diseases! 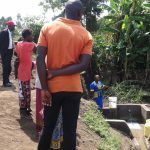 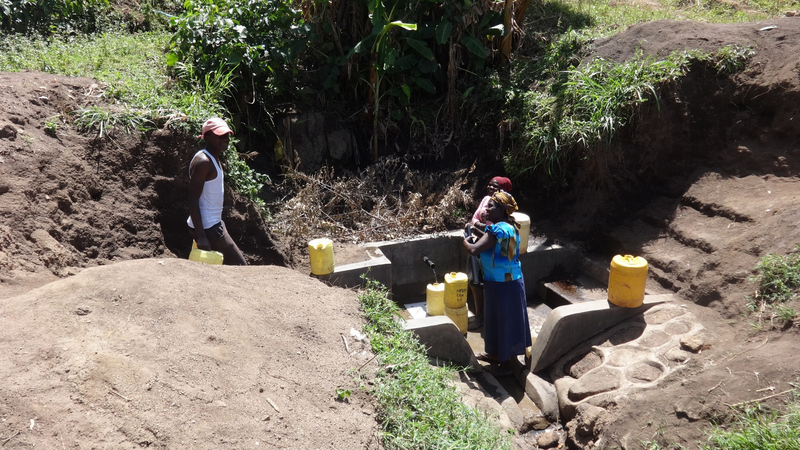 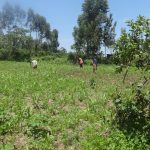 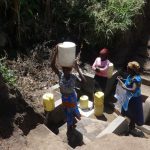 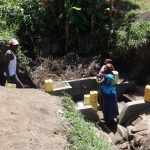 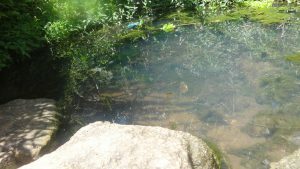 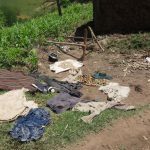 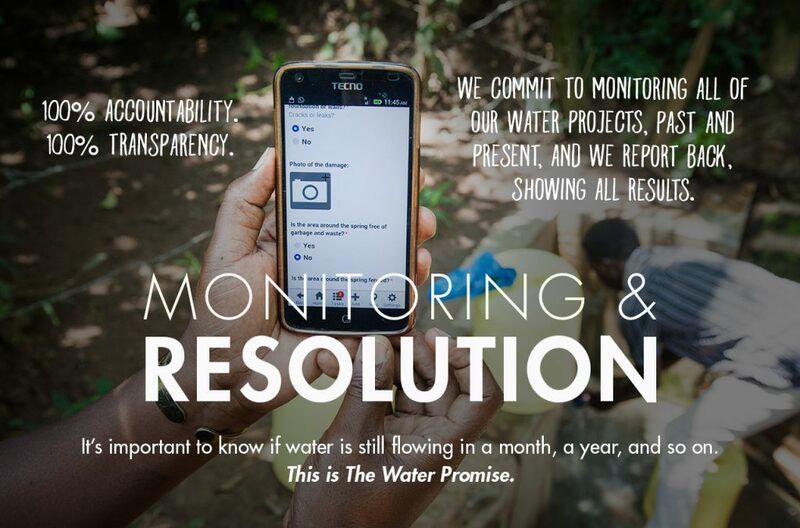 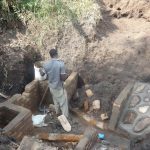 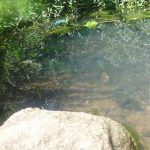 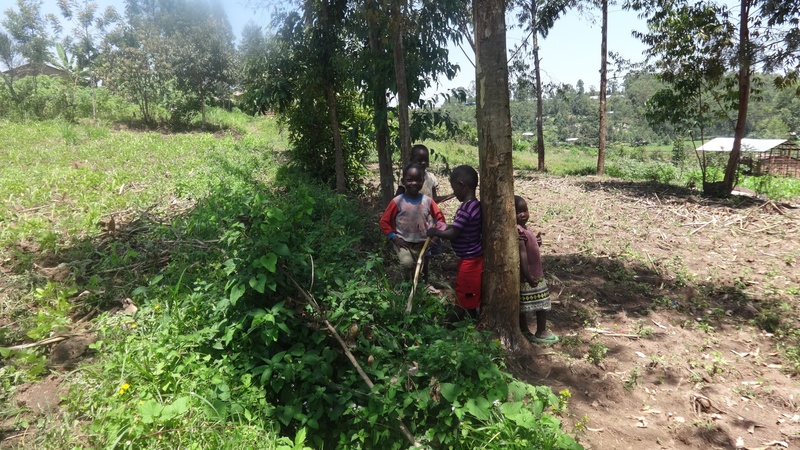 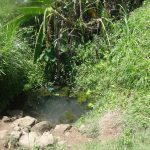 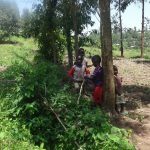 The water is no safe and clean for drinking… I promise to make sure all of the community members take good care of our spring,” Mr. Juma Were said. Shitungu Community will soon have a clean, safe source of water thanks to your donation! 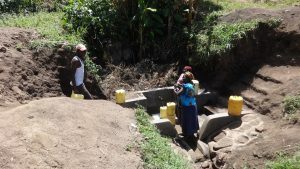 Community members have been drinking contaminated water from Omar Rashid Spring, and contend with the consequences on a daily basis. Our partner conducted a survey of the area and deemed it necessary to protect the spring, build new sanitation platforms (safe, easy-to-clean concrete floors for latrines), and conduct sanitation and hygiene training.